On October 26-27, Polish National Audiovisual Institute (NiNA) organized the annual Culture 2.0 conference/festival. The attendants were given a chance to participate in a range lectures, workshops, games and demonstration. Full conference programme is available at the conference website. PSNC was the event’s partner, Platon TV recorded the event, and the Digital Libraries Team was responsible for operating the “Digital Archives Tool Shop”. At the first stand (Scanning and Processing) the visitor were invited to digitize materials they brought from home. We presented the scanning process and its result, and explained how the quality of the result can be improved after it finds it way to a computer disk. All tasks at this stage were performed using the DigitLab system, with tools such as ScanTailor, gScan2PDF, Tesseract or SimpleScan. We treated the taks as a kind of exam for DigitLab, and we think it passed with flying colours. Direct contact with users is a great opportunity for every tool creator. The comments and suggestions we received will be reflected in the next release of the system. Stand no. 2, the one with the peculiar name (Tran2|>rip>ion), presented the “Virtual Transcription Laboratory”. VTL is a portal which allows users to create full-text versions (transcriptions) of textual documents. 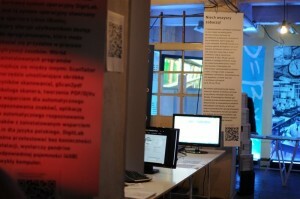 As demonstrated at the first stand, the result of a digitization process is a graphics file – the digital representation of the document that was scanned. However, it does not contain the text of the document in a form understandable for the computer. The textual contents are necessary to create effective search mechanisms, to enhance the document’s visibility online, and to open new research possibilites. Using VTL, the conference visitors were able to automatically convert their scans to digital text in the OCR (Optical Character Recognition) process. VLT also makes it possible for users to co-edit the automatically recognized text, correcting any programme’s errors. VTL brings together automatic and crowdsourcing methods, thanks to which librarians, researchers and hobbyists can create high-quality textual representations of historical documents. At the last stand the visitors were encouraged to make their digitized resources available online in the same way professional librarians do. We tought them how to create a private archive using tools such as Omeka, and also presented the publication process of the biggest Polish digital libraries (which mostly use our dLibra software). As the next step, we explained how to check who is linking to our online resources and how to monitor their usage with free tools. A significant number of visitors had not heard about the Digital Libraries Federation or Europeana, so we put some effort into describing those portals’ functions and goals. For us this event offered a priceless opportunity to test our solutions in direct interactions with the users. Those were two very busy days, and unfortunately we did have much time to participate in lectures or workshops happening in the same place. We did manage to look around Level 2.0 (that is the 2nd floor on which we were located), where different installations were presented. One of our favourites was Waldemar Węgrzyn’s Electrolibrary in which a traditional book was used as the interface to an enriched electronic version. Electrolibrary from Waldek Wegrzyn on Vimeo.